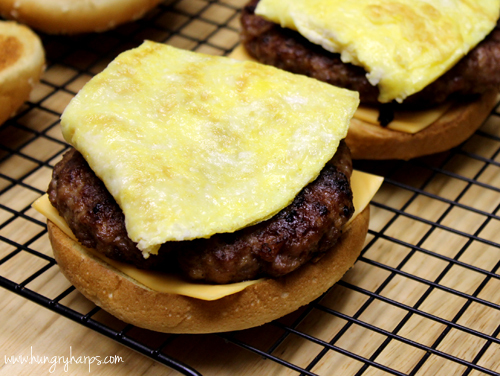 I was recently given the opportunity to create a recipe using Kraft Singles and after hours upon hours of brainstorming (seriously...) I came up with these Breakfast Burger Supremes. Even though these sandwiches are not anywhere in my diet plan, I still taste-tasted them and they are SO delicious! 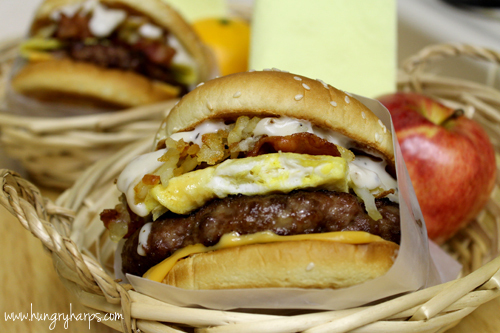 Now let's get to those Breakfast Burger Supremes! 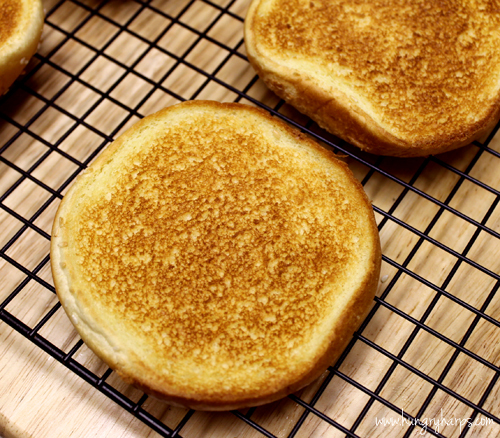 First, I started off with toasted hamburger buns. I use the broiler in our oven and it does the job nicely. 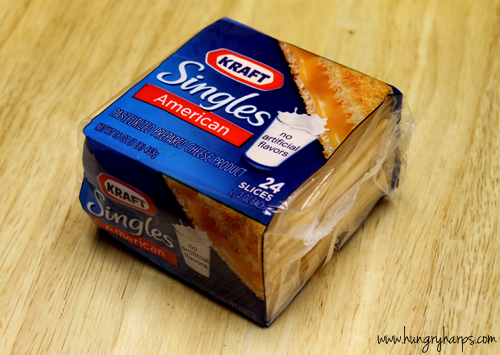 Next I added a slice of Kraft Singles - American flavor. Then came the burger. Not a beef burger, but instead a 1/2 pound sausage burger. 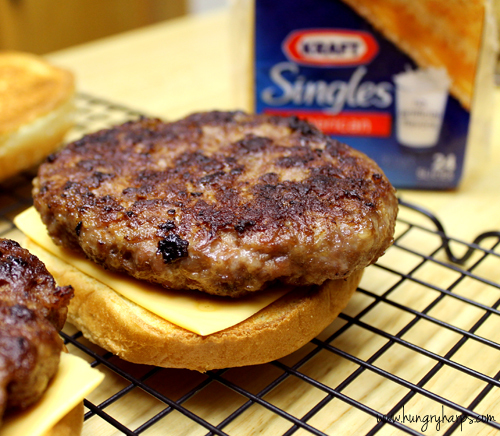 I shaped the patties out of ground sausage and then cooked them in a skillet over medium heat until done. After the sausage was the egg. Imagine making an omelet with no ingredients and not folding it, but instead flipping the entire thing over - thus forming a big egg patty. Works best when I use my small skillet. 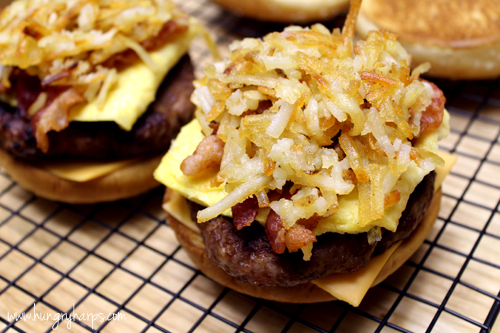 There is no way we could make a Breakfast Burger Supreme without adding bacon. 2 slices each sandwich! Last, but certainly not least was the country gravy. 2. Assemble burgers in order of ingredients listed. 3. 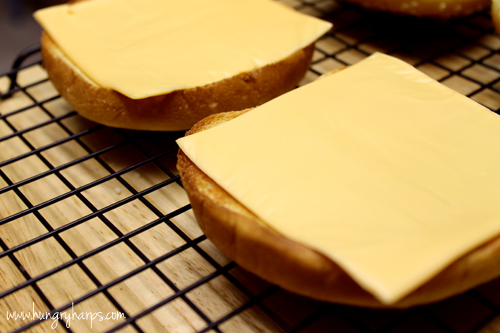 Bake sandwiches for 5 minutes or until cheese is melted. As part of the Foodbuzz Tastemaker Program, I received a coupon for free Kraft Singles and a stipend. Pinned! Even though it's not diet friendly, I may indulge once in awhile. 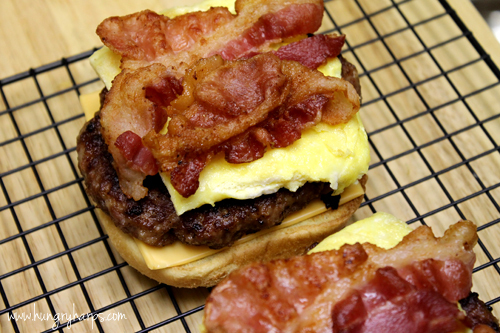 This seems like the ultimate breakfast sandwich! Hey Jess! 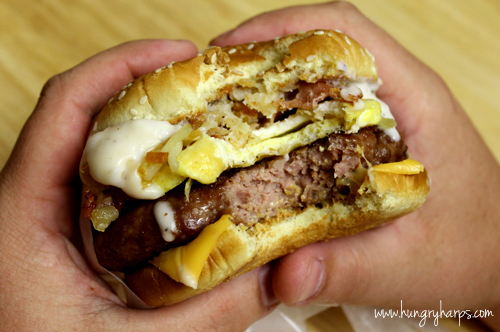 This burger looks wonderful--even to a pescetarian like myself. 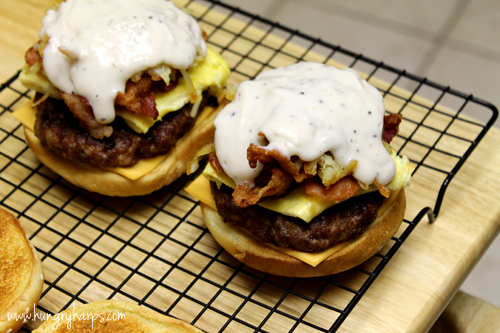 :) This is a Southern breakfast in a bun! I would eat this burger, for lunch or dinner. Looks so good. I was thinking, "Burgers for breakfast?" but then I remembered the Golden Arches have been serving them for decades...All the better made at home. Nice post and congratulations on making the foodbuzz Top 9! Ok, that would so be worth the food coma. Looks really good. Think I'm going to try this.. Thank you for sharing!! Genius!! Can you come by this weekend and make me some? pretty please? Thanks for sharing. Oh yummm, my hubby would love that after coming off of a night shift. If the pleaure of eating one of these doesn't kill ya the calories will, amazing! Mouthwatering!